As the Cassini spacecraft was running out of fuel for the thrusters used to maintain control of its attitude so that it could point it instruments at the desired targets and its antenna toward Earth so send back data, it was placed in a series of Grand Finale orbits that took it between Saturn’s rings and the planet’s upper atmosphere. Eventually, an orbit was low enough that the spacecraft burned up in the upper atmosphere. It will take years to go through all the data, but papers are beginning to be published with findings from the Grand Finale. Interesting findings include an electric current that flows between the rings and the upper atmosphere and organic compounds falling as “rain” from the rings. There’s more interesting stuff here. Go take a look. No, it’s not a solar eclipse. It’s a picture of the rings and a couple of the moons of Saturn. The large object near the center is Titan, Saturn’s largest moon and one of the most interesting objects in the entire Solar System. The central dark spot is the body of the moon. The bright halo is atmospheric haze above Titan. The gases of the atmosphere scatter sunlight. Saturn’s rings are shown nearly edge on. Enceladus, a small moon, is at about 4 or 5 o’clock at the edge of Titan. 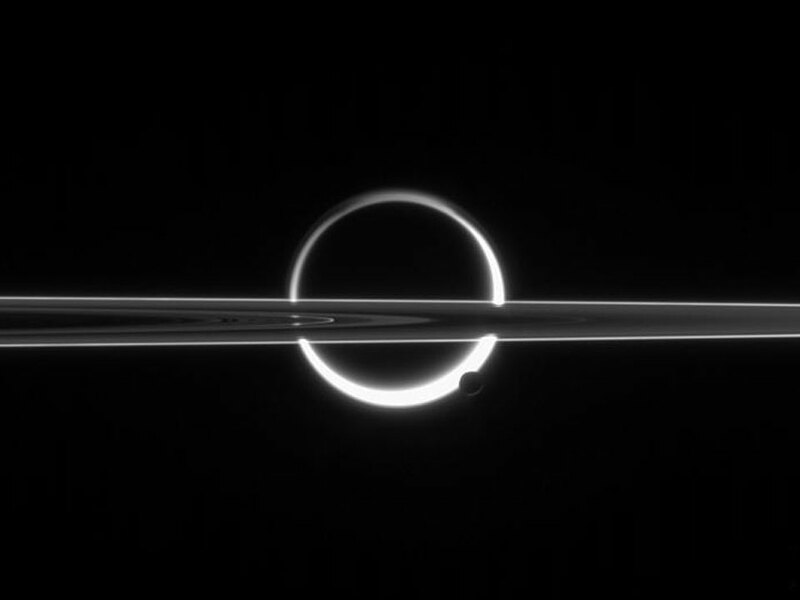 This image was taken with the Cassini spacecraft’s camera pointing almost directly at the Sun, so the surfaces of Titan and Enceladus appear in silhouette, and the rings of Saturn look like a photographic negative. Saturn’s rings are mostly water ice in chunks that range in size from smaller than a grain of sand to mountains. The ring system extends 282,000 km from the planet, but it’s only about 10 m thick in most places. 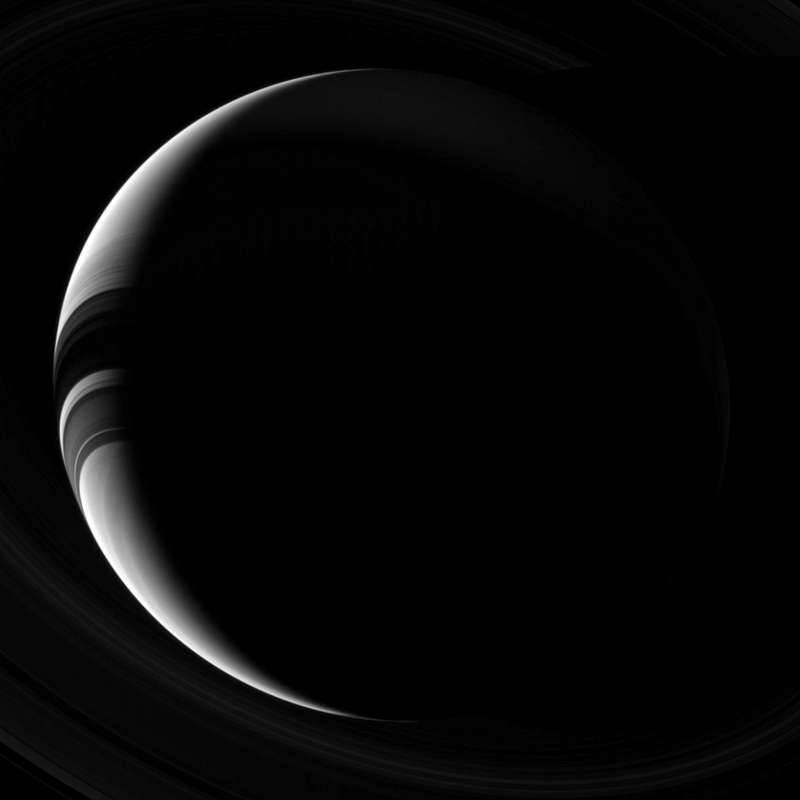 Looking from some angles, it’s possible to see through the rings—as in this that looks from south to north. The Cassini spacecraft took the images stitched together in this natural-color mosaic in April, 2007, when it was about 725,000 kim from Saturn.